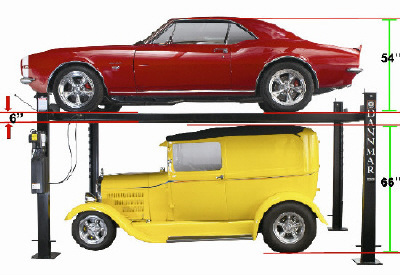 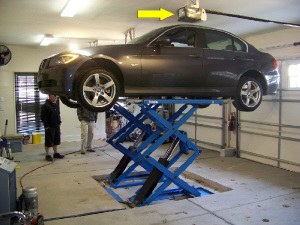 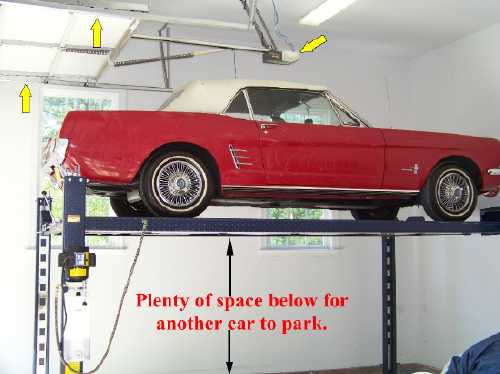 There are several important things to consider before purchasing a new lift for a home garage. 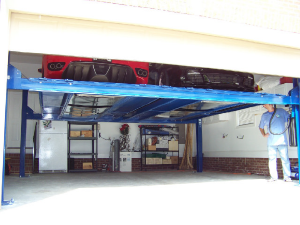 The main thing to consider is whether or not your car will be able to lift the entire height of your garage ceiling without encountering obstructions. 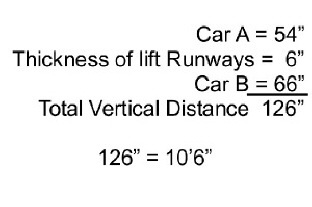 With AEI these issues can be easily resolved. 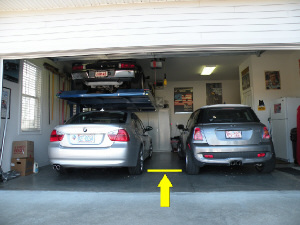 Example: 11′ garage ceiling height (132″) minus 10’6″ of total vertical distance (126″) equals 6″ of cushion space leftover. 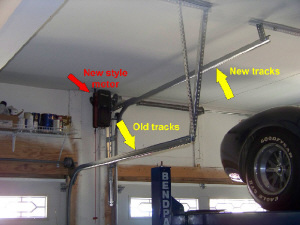 Examples of overhead obstructions which limit lifting travel in low-ceiling residential applications. 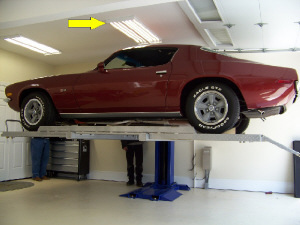 Light fixture may come in contact with roof of vehicle. 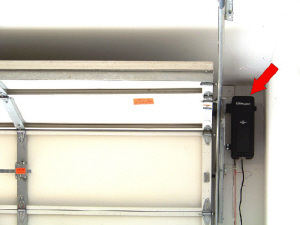 Garage door motor may come in contact with roof of vehicle. 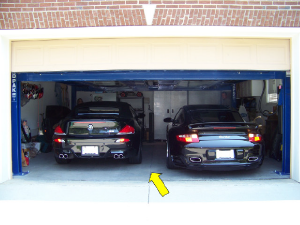 Notice the traditional style garage door track against the modified version in the background. 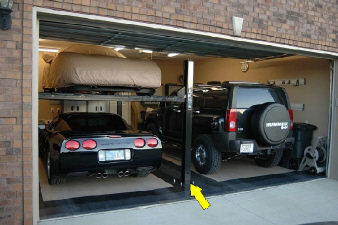 This allows the garage door to be raised while a vehicle remains on the lift, without worrying the garage door will come in contact with the vehicle’s trunk lid or rear glass. 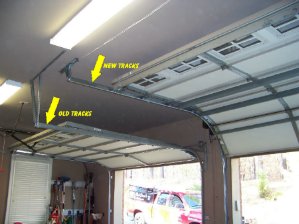 Notice the garage door tracks follow the lines of the vaulted ceiling. 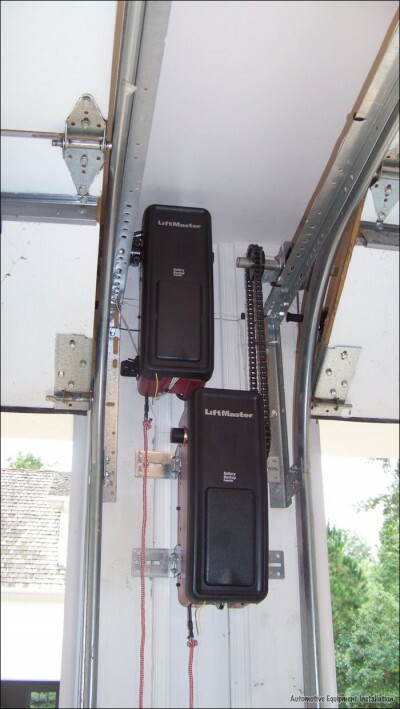 Opposing Lift Master door openers living side by side cleanly, utilizing drive chain system. 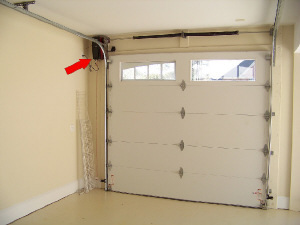 This eliminates the traditional garage door motor hanging down in the middle of the room. 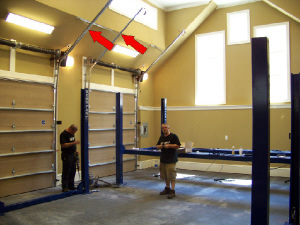 Notice the posts situated in the natural walk through area.